Fig Collection of 3 plants saving £4.40 In this collection you will receive one 2 litre plant of the following varieties. 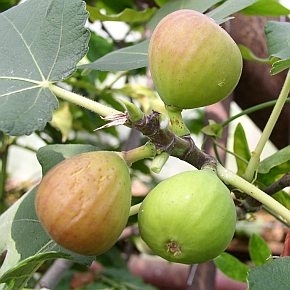 Brown Turkey - A delicious fig - very prolific. A hardy variety for outdoors but also good under glass. The red flesh has a rich and sweet flavour. For best results plant into a pit to restrict root growth. Pick fruits in August to September. Self fertile. Madeleine des Deux Saisons - Very sweet and not grainy. Very resistant to cold. Was cultivated at Versailles in the 17th century as it withstood the low winter temperatures. Left to own devices will make a tree of 5 metres. Two crops per year. July and September. Fruits can be very big up to 120 gms.